Shakshoka is a term commonly used for an egg dish that is make by sauteing onions, tomato and eggs. 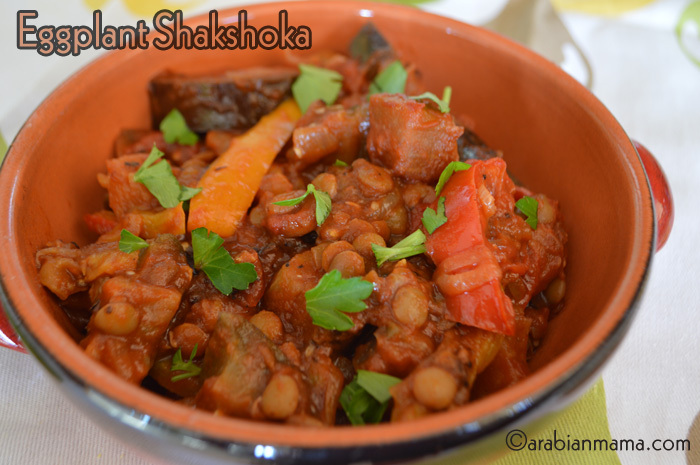 In this recipe we’re going to give shakshoka a new meaning. My late father really liked having egg shakshoka for a special breakfast, so mom used to make it without onions, she always argued with him about how inconvenient it is to have onions in the morning :). 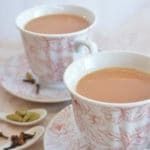 For me, I do not mind having onions in my breakfast, in fact onion is a crucial ingredient in this dish, so I would go to dad’s side in this argument. 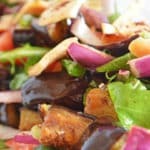 Eggplants are widely and wildly used in the Mediterranean and Middle Eastern cuisines. Roasted, grilled or fried you can find a a wide variety of dishes, think about musakaa, baba ghanouj and ratatouille for example. 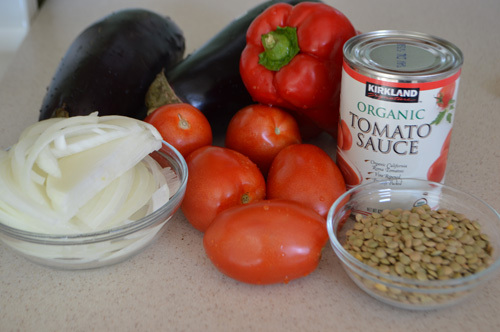 I’ve decided to make this dish to be vegetarian friendly so I’ve used lentils- use any type you have handy- but you are welcome to add ground meat/turkey for a more carnivorous dish. 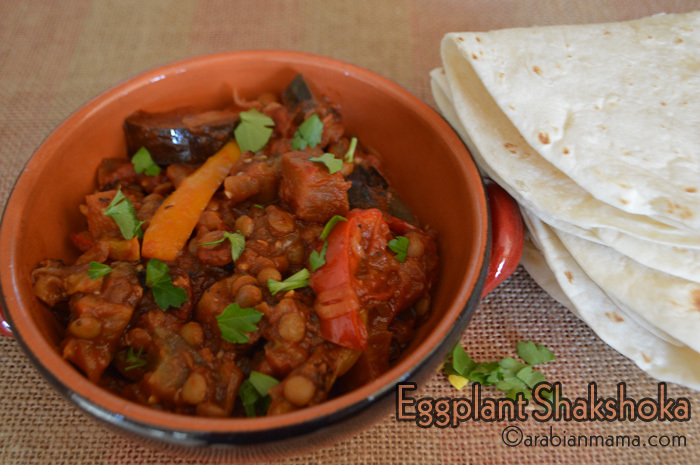 Eggplants in this shakshoka dish, are not fried which is an added bonus for this dish. 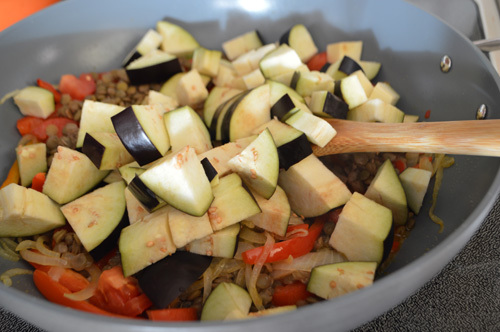 It is easy and quick to assemble, the only thing that might take time is cooking the lentils, otherwise this comes ready in less than 30 minutes. 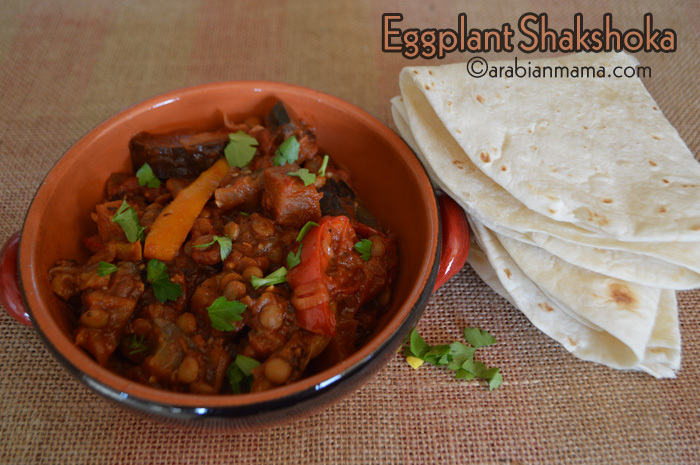 Here is a short video showing how to prepare eggplant shakshoka. 6 Tbs of olive oil. 2 c of diced tomato. optional: 1/2 c of lentils washed then cooked or cooked ground meat. Heat the oil then add the onion ,stir until translucent. Add the pepper then the diced tomato and stir to combine. Then add the diced eggplants and the tomato sauce. Continue cooking until eggplants are done. 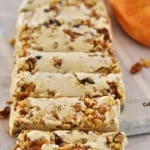 Enjoy with flat bread or even tortillas. Anything with egglant can only be delicious! This shakshooka sounds very flavourful.